GUANTANAMO BAY NAVAL BASE, Cuba A self-styled terrorist mastermind wore a camouflage vest for the first time Wednesday at his military war crimes tribunal, a clothing choice previously denied because of fears it might disrupt the court. 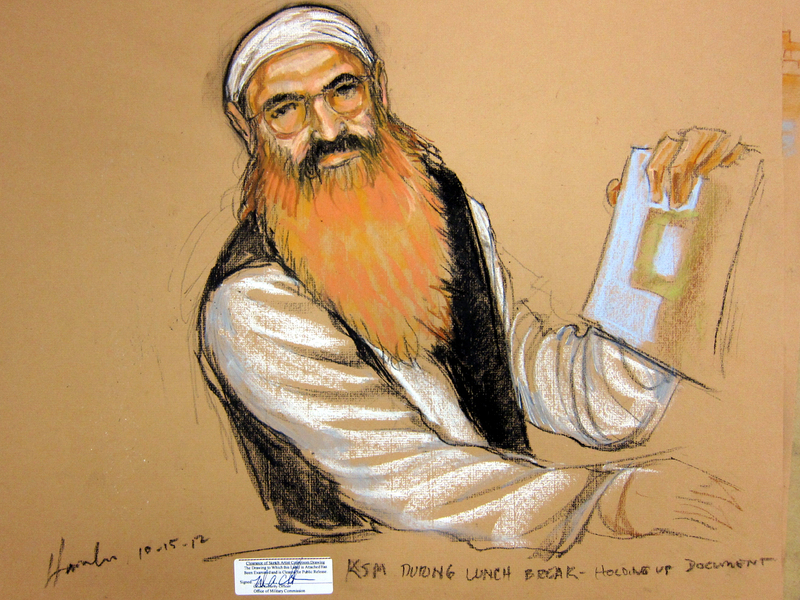 Khalid Sheikh Mohammed, who has told authorities he was the mastermind of the Sept. 11 hijacking plot, wore the woodland-style camouflage vest with a white tunic and turban at a pretrial hearing at the U.S. base in Guantanamo, Cuba. The 47-year-old prisoner's attire had no apparent effect on the proceedings. Mohammed, who did not attend the first part of the morning court session, sat quietly at the defense table. He made no statements, and no one in the court mentioned his clothing. Mohammed, whose bushy beard is dyed a rust color with henna, considers himself a prisoner of war, and he wanted the same right to wear a uniform as the Japanese and German troops prosecuted for war crimes after World War II, according to his lawyers. But when he and a co-defendant sought to wear camouflage items at their May 5 arraignment, their request was denied. At the time, the commander of the Guantanamo Bay prison said the camouflage might make it harder for the military prison guards to gain control if necessary, suggesting the clothing could create confusion about telling the difference between prisoners and fellow troops. Prosecutors also argued it might make a mockery of the military tribunals. "The detainee's attire should not transform this commission into a vehicle for propaganda and undermine the atmosphere that is conducive to calm and detached deliberation and determination of the issues," prosecutors wrote in a court motion. The judge in the case, Army Col. James Pohl, rejected those arguments Tuesday. He dismissed the suggestion that the more than a dozen military members in the courtroom would have any problem distinguishing the bearded defendants. But just to be sure, he specifically prohibited them from wearing any items from U.S. military uniforms. There was no apparent reaction to the camouflage from the small group of relatives of Sept. 11 victims who were chosen by lottery to view the proceedings at the base. One of them, Al Acquaviva, stood at the soundproof glass that separates spectators from the courtroom and held up a photo of his son Paul, who was killed in the World Trade Center, as Mohammed was entering the courtroom. "I hope he looks," Acquaviva, who lives in Wayne, N.J., muttered to himself. Most of Wednesday's hearing dealt with security rules that the government has proposed to prevent the inadvertent release of classified information. The government has already acknowledged some details about the secret prisons, including the fact that Mohammed was water-boarded 183 times, but prosecutors have said that restrictions are necessary to prevent the release of information that would reveal information about intelligence sources and methods. A lawyer for the American Civil Liberties Union, Hina Shamsi, urged the judge to reject them, arguing that they were overly broad and intended not to protect national security so much as to prevent the public from learning more details about the harsh confinement of the defendants in the CIA's prisons overseas. "We are aware, your honor, of no other protective order that is as radical as what the government is asking you to judicially bless here," Shamsi said. But government prosecutor Joanna Baltes said the ACLU and other critics of the proposed rules are exaggerating the restrictions. She said the rules are similar to those in major terrorism cases in civilian courts. "I think it is a very inflammatory allegation for the ACLU to come in and claim they have never seen anything like this," Baltes said. Mohammed and his four co-defendants are accused of planning and aiding the attacks on Sept. 11, 2001. They face charges that include terrorism, conspiracy and 2,976 counts of murder in violation of the law of war, one count for each known victim of the Sept. 11 attacks at the time the charges were filed. They could get the death penalty if convicted. The court is holding a hearing this week on about two dozen pretrial motions in preparation for a trial that is likely at least a year away.